The personal protective equipment market has been emerging at a thriving pace due to the growth in industrial development globally. The rapid rise in awareness regarding personal safety is also anticipated to propel the growth of this market across the world. Personal protective equipment such as goggles, shield glasses, and helmets are designed to protect the user from damage or infection. Sectors such as transportation, manufacturing, and construction are also boosting the market growth across the world. This market is estimated to rise rapidly in the forecast period due to the adoption of strict regulations and policies in factories and other workplaces by governments of various regions. According to the report, the global personal protective equipment market was valued at US$40.4 bn in the year 2016 and is estimated to be worth US$72.08 bn by 2025. The market is likely to exhibit a CAGR of 7.0% in the forecast period 2017-2025. On the basis of type, the global personal equipment market is categorized into head protection, face and eye protection, protective clothing, hearing protection, fall protection, and professional footwear. Among these, the fall protection type covers majority market share globally. Experts in the personal protective equipment market expect the fall protection segment to lead in the upcoming years. As per application, the global personal protective equipment market is segmented into the manufacturing, construction, chemicals, oil and gas, pharmaceuticals, healthcare, food, and transportation sectors. Of these, the manufacturing sector was the prominent segment in 2016. This sector is projected to lead the global market over the forecast period. In terms of geographical regions, the global personal protective equipment market is divided into Asia Pacific, North America, South America, The Middle east and Africa and Europe. In 2016, North America with a market share of 38% dominated the market globally. Owing to the increase in adoption of personal protective equipment across different industries, North America is estimated to lead the global market over the forecast period. Emerging economy such as Asia Pacific is anticipated to offer lucrative growth opportunities in the global personal protective equipment market over the years to come. The Asia Pacific market is predicted to flourish at a robust CAGR of 7.50% between the years 2017-2025. Furthermore, this rise has resulted due to the increase in production, rapid growth in constructions, and the expansion of transportation sector. At the same time, the Middle East and Africa region is estimated to grow at a significant rate in the upcoming years owing to the rise in use of personal protective equipment and increasing number of guidelines for strict rules and regulations focusing on the work place safety of employees. In India, personal protective equipment for example durable gloves, air purifying respirators, and safety helmets have observed surge in demand in various industries in the past few years. With the increase in requirement for personal protective equipment, the personal protective equipment market is witnessing a paramount growth over the forecast period 2017-2025. The global personal protective equipment is highly competitive in nature due to the presence of numerous large players all over the world. Few of the prominent players operating in the global personal protective equipment market include Ansell Ltd., The 3M Co, COFRA Holding AG, National Safety Apparel, Rock fall Ltd., Honeywell Safety Products, and MSA SAFETY. In the coming years, the market is expected to be innovation with the introduction of disruptive models as per business requirements. Also, invention of smart personal protective equipment products are likely to enhance the safety and productivity of workers. This report on the global personal protective equipment market provides analysis for the period 2015–2025, wherein 2016 is the base year and the period from 2017 to 2025 is the forecast period. Data of 2015 has been included as historical information. 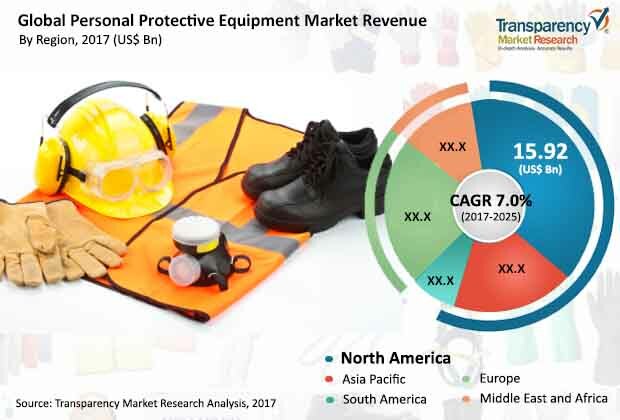 The report covers market dynamics including drivers, restraints, and opportunities expected to influence the global personal protective equipment market growth during the forecasted period. Global and regional trends that are playing a major role in driving the global personal protective equipment market have also been covered in the study. The study provides a comprehensive analysis on market growth throughout the above forecast period in terms of revenue estimates (in US$ Mn) and volume estimates (in Mn units), across different geographies. The personal protective equipment market has been segmented on the basis of product type, application, and geography. Based on product type, the market has been further classified into Eye and Face Protection, Head Protection, Hearing Protection, Protective Clothing, Respiratory Protection, Professional Footwear, Fall Protection, Hand Protection and Others. On the basis of application, the personal protective equipment market is classified into Construction, Manufacturing, Oil & Gas, Chemicals, Food, Pharmaceuticals, Transportation, Healthcare and Others. Geographically, the report classifies the global personal protective equipment market into North America, Europe, Asia Pacific (APAC), Middle East & Africa (MEA) and South America. The regions are analyzed in terms of revenue and volume generation. Furthermore, region wise prominent countries covered in the report include the following - U.S, Canada, U.K., Germany, Italy, France, China, Japan, India, GCC countries, South Africa and Brazil. The report also includes industrial evolution in the personal protective equipment market. It includes the Porter’s Five Forces analysis which identifies bargaining power of suppliers and buyers, threat from new entrant, threat from substitute and threat from competition in personal protective equipment market. Value chain analysis which identifies the key stake holders in the personal protective equipment market is also covered in the report. Furthermore, policies and regulations aiding the personal protective equipment market are also covered. The report also includes competition landscape which includes competition matrix, market share analysis of major players in the global personal protective equipment market based on their 2016 revenues. Competition matrix benchmarks leading players on the basis of their capabilities and potential to grow. Factors like market positioning, product offerings and R&D focus are attributed to company’s capabilities. Factors including top line growth, market share, segment growth, infrastructure facilities and future outlook are attributed to company’s potential to grow. Company profiling includes company overview, major business strategies adopted, SWOT analysis and market revenues for year 2014 to 2016. The major players profiled in the global eyewear market include 3M Company, Ansell Ltd., MSA SAFETY, National Safety Apparel, Kimberly-Clark Corporation, National Safety Apparel, Uvex Safety Group, COFRA Holding AG, Honeywell Safety Products, Avon Rubber P.L.C., and Rock Fall Ltd.